The odds are an indication of the bets chance of winning. 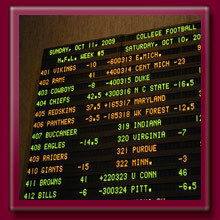 There are 3 main ways in which sports betting odds can be displayed. They differ slightly depending on where the bet is being made. In the U.K. a fraction method is used and in Europe the preferance is decimal. More commonly known as 'traditional odds' because of the British connection with horse racing.In the U.K. you'll find the fractional method used. If the odds are 5/1 will mean that the bettor will win £100 when they bet £20. If the odds are 1/5 then 20 divided by 4 makes 5 so the bettor will win £4 from a £20 stake. The bettor will always receives the stake back meaning £20 at 5/1 will actually pay out £120. £100 plus the return of the original £20 bet. If the bet is $150 to win and you place the bet to win of 150 you'll receive $100 winnings + $150 of the original money back making a total payout of $250. Probably the easiest odds to understand and used mostly in Europe. Simply find the decimal odds value and multiply it by the amount you want to bet. For example, if the odds are 4.00 and you bet $100 then you'll receive $400. Mobile sports betting is now available at many of the best online sportsbooks. The best sports betting sites understand that its important for their customers to get the latest odds immediately to be able to place their bets on time, therefore using a smart phone, iphone or other mobile device.As a result the majority of websites now come with a mobile option. Listed below are a selection of top mobile sports betting sites, recommended by Megakingssports.com for U.S. and non-U.S. residents.